The first mobile app to allow DJ's to set Serato Scratch Live and Serato DJ cue points. 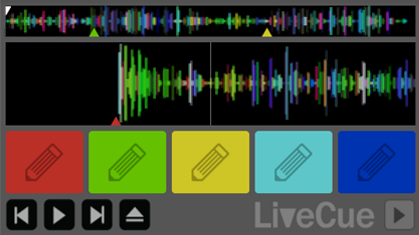 LiveCue is fast and a breeze to use. With large cue buttons, a clear and focused display with the familiar frequency coloured audio waveform. Why does this app exist? Because it's the only way possible to add / edit Serato cue points on your mobile devices. The iOS version is perfectly usable on older devices such as the iPhone 4 and iPad 1. If you have any Apple device more recent than these the application performance is greatly improved. For Android devices (min 4.1+). The Android version works perfectly well on slightly older devices. If you have any Android device more recent, the application performance is greatly improved. LIVECUE IS NOT ENDORSED OR OFFICIALLY SUPPORTED BY SERATO AUDIO RESEARCH LTD.
Software is never perfect and devices and operating systems are always changing. Help us to help you by letting us know of any issues you are experiencing or feature requests you may have. How do I load files on the iOS version? Connect your device to your computer via USB, open iTunes, select the "Apps" tab, scroll down to the file sharing section and click Add Files. How do I get my edited files from the iOS version? See above, but this time just drag the files out of the shared files section to your desktop. MP3 and AIFF files are currently supported. The iOS app also supports M4A files. We'd love to hear from you. Features requets, praise, complaints, whatevers on your mind. Just fill in and submit this form and someone will get back in touch.